Gunther’s Gourmet Gala Blogger Review Joe Bolland BBQ Company’s PittSauce – I Love It Spicy! Joe Bolland Barbecue Company is a new company that will be producing sauces and dry rubs. Our current product in development is “PITTSAUCE”. 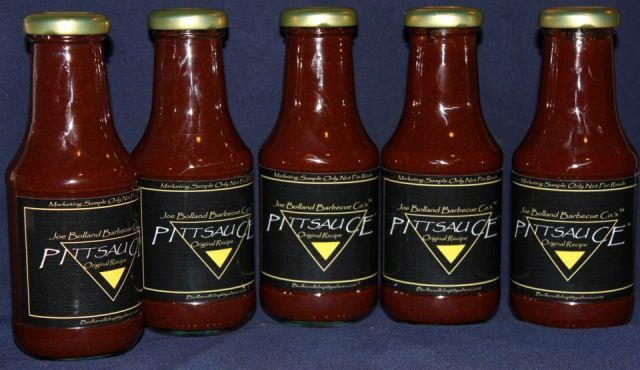 Pittsauce is a finishing sauce, or glaze and tastes great on pork, chicken, burgers, and more! To provide quality sauces and dry rubs to enhance you barbecue cooking with a burst of flavor so good you’ll want to lick your plate clean! I grew up in the suburbs of Pittsburgh, PA where barbecue was an event. We would often have a barbecue on the weekends. When I returned from Iraq in 2005 and moved to Virginia, I discovered barbecue was not an event, but a cooking style of seasoning, smoking, and slow cooking a variety of meats such as pork, beef, chicken, and sausage to name a few. As I sampled barbecue from several local restaurants I became hooked. I learned that there were many different styles: Carolina, Memphis, Kansas City to name the more popular. Soon my passion turned me to my own kitchen where after many long hours I perfected my first sauce. I thought hard about what to call it when a friend suggested “Pittsauce” to pay homage to my hometown of Pittsburgh and referencing a barbecue pit. It sounded good so I went with it and that is how it all began. Downtown Pittsburgh is known as the golden triangle, so I incorporated that into the logo. Pittsauce is currently being developed and tested, and I hope to have it available later this year. Pittsauce is great as a glaze to brush on your meats after they have been cooked and putting them back on the grill and allow the sauce to caramelize. Also great on burgers to make a barbecue burger, and as a dipping sauce. If all goes well I hope to follow up Pittsauce with a dry rub that I will call “Pittspice”…getting the theme here? So, whether your having a barbecue, or having barbecue for dinner, I hope you will make Joe Bolland Barbecue Company apart of it. Thank You!